OUTPUTS 5V ON THE DIGITAL PINS. - Arduino compatible development board with ATmega 328p, rated at 3.3 volts. 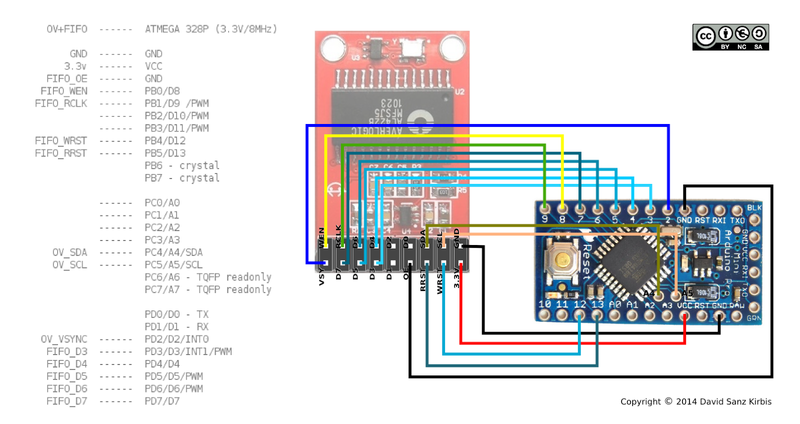 I use a clone of a Sparkfun Arduino Pro Mini at 8MHz and 3.3v. This doesn't have USB, so I use a USB to serial adapter that works at 3.3v. There are other boards that should work too (not tested): Arduino Pro (3.3V version), OLIMEXINO-328, Iteaduino Uno, Seeeduino, Freaduino, Youduino, Bouno Lite, etc. 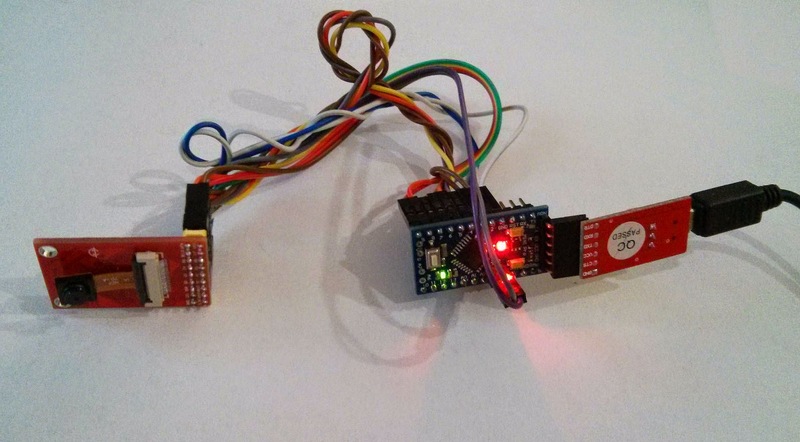 - A CMOS module with FIFO and an ov7670 or an ov7725 sensor (I've tried both, and setup the register parameters). At the moment I'm working only through the FIFO, but may try synchronize the microcontroller clock directly with the CMOS sensor, as int the AVRcam project. I've tested an ELH 30w FIFO module and the Alientek OV7670 v2.2 module. Both use a 12MHz clock. Other modules use a 24MHz clock. While this affects only the framerate selection parameters, some newer versions have a different schematic/pinout which need VSYNC signal to be inverted, these will not work with this setup. - Female to female jumper wires to connect the Arduino board to the CMOS module. You may edit the file IO_config.h of the arduino sketch if you want to make some changes, just pay attention on the VSYNC pin, that is tied to INT0 interruption. The code will either stream a 80x60 pixels image, in different pixel depths, or detect the boundaries of the brightest/darkest blob within a threshold. Edit: you get too much garbage in the processing console you may need to change the baudrate to match your system capabilities. Try with substituting the 500000 for 115200. Some people have added pullup resistors to the SDA and SCL lines and disabled the internal pullups. However, as I'm working with a 3.3v version, in this setup things worked straight away without these steps. And chage the port name "/dev/ttyUSB0". I'll try that all the information published here is related only to 100% open hardware and software. One of the pioneers pushing the little microcontroller capabilities. Currently in development, it will be an amazing and affordable platform with outstanding capabilities, and the only one in its class completely open. how do i see if it is working? and install it (see: http://www.processing.org/tutorials/gettingstarted/ ). and copy the entire folder inside your Processing sketchbook folder. Open the file receive_stream.pde with processing and run the sketch. Once running press the space key to toggle the stream modes. The first time you run processing, it creates a folder called "sketchbook" in your computer (the place depends if you use Mac, windows or Linux). Inside the sketchbook folder is where you should copy the folder "receive_stream" and its contents. So you have the files receive_stream.pde, global definitions.java, and simpleKalman.java inside the folder "sketchbook/receive_stream/". Please read the processing.org wiki and tutorials to inform yourself and learn how to use it. What system are you using? Did you read the post? : "You will have to change the serial port name to match your system"
"You are assumed to have some knowledge of the arduino platform and environment, and also the Processing.org development environment"
arduino communicating this with the processing ..
"inited OK, sensor PID: "
Yes, pin 3.3v is just the power line, but the logic levels that go to the sensor (SDA, SCL and VSYNC) have to be also 3.3v or lower. A "3.3v arduino" means that the logic levels are 3.3v not 5v. You can still try to put resistors as explained here: http://nicolasfley.fast-page.org/wp-content/uploads/2013/09/schema_arduino_FIFO_OV7670.png and see if your sensor is still alive. I got a school project, i should take pictures with OV7670 camera using my computer and an arduino pro mini. When i was connecting the camera on the arduino, i find out that my camera hasnt the following 4 pins: WEN, RCLK, SCL, SDA so cant continue with my project. Sketch uses 7,818 bytes (25%) of program storage space. Maximum is 30,720 bytes. Global variables use 804 bytes (39%) of dynamic memory, leaving 1,244 bytes for local variables. Maximum is 2,048 bytes. then i did upload and upload done. The buffer passed to readBytesUntil() is to small to contain 11 bytes up to and including char 10"
Why it does not show image? I wonder if the code is sensitive to cpu clock speed. I had succesful init using 16mhz arduino and it send something when running the processing scketch but nothing appeared. No image, just a dark screen and text. I kept hitting spacebar but no effect. Cpu clock speed shouldn't be a problem, but please be aware that the 16mhz arduino works with 5v and the sensor with 3.3v, so don't connect it to 5v logic directly. You would need a voltage translator or an arduino that works at 3.3v. Thanks for fast response! My arduino runs 3.3v so that isn't problem. I have never had any problem with running 16mhz 3.3v and actually have never seen anybody to report problems so I use this setup all the time when prototyping. Do you happen to have any simplier codes that just get an image and send it to processing? Try to lower the baudrates to 38400 and change the mode (press space until you see say stream2ppb). Be patient because at that speed and pixel depth it takes a while to transfer the frame. Transfer rate and stability are sometimes very sensitive to the good contacts and wiring. I think there is still something wrong with code (processing or arduino?) because there is never pictures like in your video. If it were about bad contacts i think there wouldn't be the exactly same behaviour every time? No I have tested it with every possible baudrate many times and every time picture freezes to messy nonsense after running short time and never recovers. Before this camera detects only bright light but gives no real pictures. Do you think that error message isn't a probelm? Thank you very much for your help! Your code solved the processing problem and now it streams pictures with any baudrate without freezing and giving error messages. However the pictures don't make any sense. Theyd are kind of fractal-like blobs changing their size a bit all the time even when camera isn't moving. Pattern are kind of images because they react going darker when i shade the camera lense. I have to investigate further whats wrong with my setting. I think it could about reading the FIFO because camera seems to work. It might still be some issue with the transfer: the bits are encoded in the bytes sent, if you see the function buff2pixFrame, the pixels are encoded in YUYV. The most consistent image should be at STREAM1PPB (one pixel per byte) because at least any byte received corresponds to one pixel each (even if it arrives in wrong order or some get lost). Also, sometimes twisting the wires from the arduino to the sensor helps to make the data more reliable. Thank you very much for the support and code fix! can you help me !!!! my name's draka. I can't not show up the picture. As you can see in the specs, that arduino has: "Operating Voltage 5V"
If you connect it directly to the sensor (3.3v) you will probably harm it. Hey David, I'm using a DCCduino Nano which I believe is 3.3V. I've changed the baud rate to 115200 for both the Processing and Arduino code. I'm using a GCCduino Nano which I believe is 3.3V. I set the baud rate for both the Processing and Arduino code to 115200. Would you be able to use a bluetooth module as opposed to a usb cable to view this? I'm trying to build a small short distance wireless module with my pro mini. It should work, if you use a serial bluetooth module it will send over bluetooth anything you send to the tx line. However, the maximum baudrate (I think 38400) may be very low compared to the USB wired serial connection. The nicolasfley site is down, and I'm not sure what the schematic for pulling down 5V to 3V3 is. Is it for SIOC and SIOD only? Do I also need VSYNC? What values of resistors are needed - 10k from SIOC to 3V3? Google for: "i2c 5v 3.3v divider"
The divider is unidirectional, as you can only send commands to the sensor but not read registers. Also, if you read the sensor's pixel data lines directly with the Arduino pins you risk sending 5v by mistake. Then it never says anything else. I've ordered a 3.3V Arduino clone that should come in soon, so these problems hopefully will be gone. Also, I didn't quite understand your other comment - "if you read the sensor's pixel data lines directly with the Arduino pins you risk sending 5v by mistake." I'm not sure what you mean by that. My camera D0-D7 pins are connected to the Arduino, but since they Arduino pins are configured as inputs, it shouldn't make a difference right? About my comment: imagine you upload a sketch that outputs 5v by mistake, with the sensor still plugged to the Arduino. However, I still get jumbled garbage from the camera output. I must have messed up code or something. I have low baud rate, great wiring (helped by my electrical engineering friend), I tried a new camera after adding the voltage dividers to make sure my camera didn't burn out, I get "inited OK, sensor PID"... but I only get garbage output. Sometimes it looks like the output gets "whiter" when I point toward a light source, or all dark/green when I put it in the dark, or red when I point the camera to my red shirt. But it's always interspersed with the garbage green lines, and out of order. Hey David! :D I have a positive update! But it only picks up light/dark and shows blobs, and has a green tinge. I'm not in a dark room. It was my fault; I did not follow the wiring connections because I wanted to add all the data pins. I connected WE to an analog pin and changed the pin settings in the code. Now that I have changed them back and only plugging in the 5 data pins that your example uses, the camera is able to give me a blob. I've made the sensor ID model edit in sensor.cpp, and on 115200 baud. Now I am trying to figure out how to get actual camera feed, not just light blobs. Some sensors come with the lens holder displaced, also check the focus. 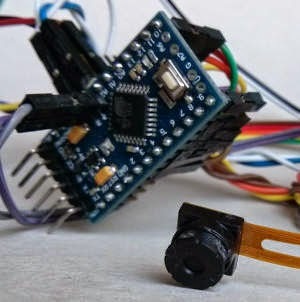 I am trying to capture image vidio from ov7670 (http://dx.com/p/ov7670-300kp-vga-camera-module-for-arduino-147742) using arduino mega. That module doesn't have fifo, so you have to send the video lines on-the-fly to the computer through the serial port. At the moment the only code I've developed uses a module with fifo. Thank you very much for your work. It worked for me the first time. Arduino: 1.6.7 (Windows 8.1), Board: "Arduino/Genuino Uno"
WHY DO NOT USE D2,D1,D0 PORT ??? Hi, sorry for the late answer. Did you solve your problems? I discarded the least significant bits to reduce the amount of data to stream and get more FPS. DO you have Color Tracking code?? what meaning for this code ? can you Explanation for me ? Try wiring both cameras in parallel, except for the data lines. Wire D3-D7 of first/second camera to different pins in the arduino. Then modify the code to read an image twice as wide: 160x60, and read large rows (160pix), first half row 80pix from the D3-D7 from first camera and next half row 80pix from the D3-D7 from second camera. Modify the all the code related to capture and streaming to match the new frame with of 160 pix. For working with arduino MEGA2560 what file I need to change ? And you will have the two rows stored in the buffer, one after the other. Finally i'm using Arduino UNO so i dont have to change the IO_File but for work to 3.3v I put a resistors to make 5 to 3.3v but I guess that is necesary just for SDA, SCL and VSYNC ports beacuase if a make that for all of them it does not work isn't it ? In console just "try" but is not conected what is that for ? Hey Can you tell me why are you using F_W to be 80 and F_H to be 60? My project is still in the making..Will update you when that's done. In the mean time can u help me with another issue. I am trying to also connect this camera with raspberry pi board. No documents on it have been found. Do you think its doable? Those modules output 25MB/sec with an 8 bit bus and a strobe, the Pi GPIO is NOT up to handling that." Hey.. I wanted to know one more thing. My OV7670 comes with HREF on pin 6 instead of WRST. So how do i use it in my code? If so, just connect the arduino pins to your module according to the labeling. Note WEN is labeled as "WR". This is the camera that I am currently using!! 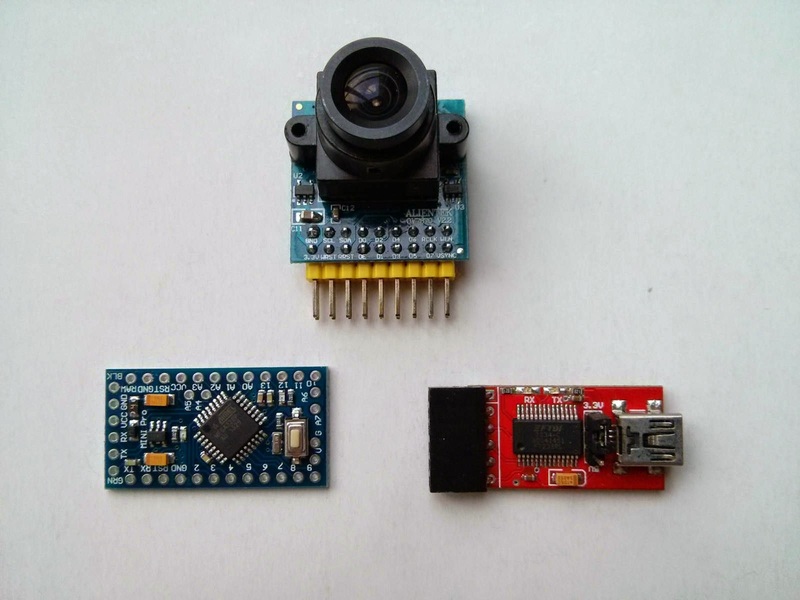 Hello,i have a OV7670FIFO camera module, i want to take photos with it, i have arduino mega 2560. I can't connect my arduino to the camera module. Hello, can you help me to connect my arduino mega2560 with my camera module OV7670 FIFO ? My pins are ( CS RRST WRST RD WE PWDN SCL VSYNCH SCL SDA XCLK D0 D1 D2 D3 D4 D5 D6 D7 ) i want a correspondance between my pins and those posted ? Remember to put a voltage shifter inbetween the Mega (5v) and the sensor (3.3v)!!! The rest is obvious. Ignore XCLK and PWDN. Can you tell me what ppb stands for and why is it divivded into 8,4,2,1,0? hello, please can you tell me how can i connect my camera module with my arduino mega 2560 ? 1/ The FPS of streaming image I have received on the processing GUI window (at 0PPB) just about 1.1111 fps. Its look not smooth than your demo in youtube (your is 3.333 fps). How can I increase FPS ? 2/ My image receive on GUI is too dark than your demo. In the light area, the image is not bright enough to see, just like a grey and dark, but if I turn the camera to the bright direction, I can see a little thing with higher light effect. How can I increase the brightness to get the better image ? _Thank so much for your support and try to solve my problem !! Ah thank you for reply ! My serial wires just about 20cm. try 10cm and keep the wires separated from the others. Okay thank you :D I'll try to fix it. Im come from VietNam and studying at Ho Chi Minh University of Science. I'm currently based in Valencia, Spain, working in R&D, and did my studies at the Polytechnic University of Valencia. why am I having this problem ? Arduino: 1.6.11 (Windows 10), Board: "Arduino Pro or Pro Mini, ATmega328 (3.3V, 8 MHz)"
Does the original code from github (with all the files) work for you? I'm using a GCC aduino Pro mini 3.3V. I set the baud rate for both the Processing and Arduino code to 500000. Hi, please check the wiring, if the sensor is inited ok, it should work fine. Did you fixed the problem ?? could please help with some feedbacks ? Did you fixed the problem ? So it would be helpful if you provide some feedbacks on how you solved it . I am very thankful for your effort on providing these help for using the module. But i am having some issues on displaying the images on the screen. Both the codes on arduino IDE and processing are verified with no any errors and also i have checked through some of these baudrates; 38400, 115200, 56700 and 500000 with all different modes. But still the output on processing is black. Panic! INIT sensor keeps failing. and also in the processing console no any initialization messages shows up. Please check the wirings again and make sure you are using an 5v 8MHz arduino.